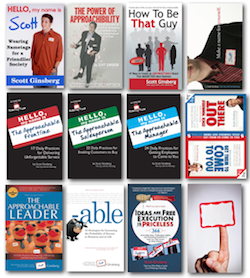 Win a Copy of The Nametag Guy's New Book! ~ HELLO, my name is Blog! The purpose of this book is to sell you on my theory of the universe. And that you can’t make anything happen – but you can (greatly) increase the probability of that thing happening ... by making yourself more "-able." Advanceable. Addictable. Bookable. Brandable. Breakable. Buyable. Buzzable. Callbackable. Checkbookable. Discoverable. Engageable. Googleable. Invokable. Meetable. Nameable. Needable. Non-nextable. Openable. Pursuable. Referable. Requestable. Retweetable. Revisitable. Sellable. Show-Up-Able. Sought-after-able. Spreadable. Successable. Superiorable. Trustable. Unbullshittable. Unequalable. Yessable. 1. Create your own "-able" word. What's your theory of the universe? 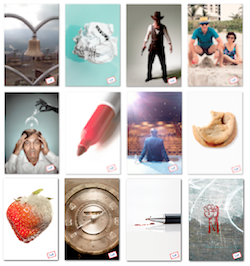 What's your secret for increasing the probability of success? Name it with a word that ends in the suffix "-able." Note: Please do not use any of the ones listed above, as they have already been written about, and can be found in the book. 2. Write a blog post explaining your "-able" word. In no more than one thousand words, explain what your word means - and why it can help others increase the probability of success. 3. Spread the word. 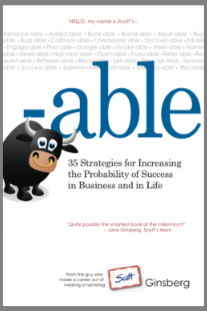 On your blog post, include the link to -ABLE's Amazon page, the link to Scott's blog and an image of the book's cover. Feel free to copy the image from Amazon. 4. Send an email to scott@hellomynameisscott.com. Introduce yourself, send me the link to your blog post and give me your address. I will send you a copy of the book! *Submissions will be accepted until 11:59pm on September 15, 2010. *As the editor, I reserve the right to modify or reject any content as I see fit. *Only the first fifty people who submit will be considered for the promotion.